Just How Bad Is California's Drought? Here's A Scary, 10-Second Answer. 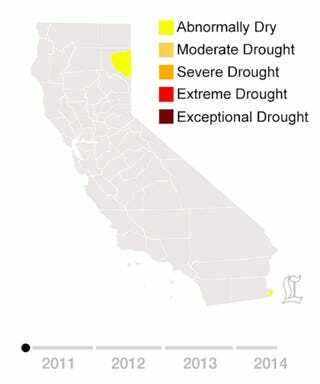 California continues to dry up. The latest figures indicate more than 80% of the state is in extreme drought, or worse, exceptional drought. These are sobering numbers, to be sure, but for an even better perspective on the drought's unprecedented progression, check out this GIF, created by L.A. Times reader Alvaro Valiño. Each frame of the animation is a snapshot of weekly drought conditions in California, as recorded by the U.S. Drought Monitor. By combining close to 200 of these snapshots, the GIF provides a quick, week-to-week visualization of the state's ever-worsening situation that extends all the way back to 2011 – the last time California's drought map was clear. For yet another angle on the progression of California's drought, check out this sprawling infographic from the L.A. Times, which expands the GIF up top out into its constituent parts.